It could be the start to an important year in the careers of two top Stingers players. On May 1, U Sports announced that offensive linemen Matt Halbgewachs and Maurice Simba would be participating in the 2018 East-West Bowl hosted at Université Laval. “We had known for awhile already, but it was nice to see everyone else’s reactions. They were all excited for us,” said Halbgewachs, a six foot, five inch guard from Saskatchewan. In January, the two were notified that they would be named to the roster for the five day event. The East-West Bowl is the first step for university players hoping to be drafted into the CFL each year. It’s four days of combine style practices and workouts before an all star game featuring the country’s top players. The East-West Bowl will take place Saturday, May 12 at 12:30 p.m.
All of this is watched by CFL scouts preparing for the 2019 draft and noting who might find themselves on a professional roster next season. “It’s definitely the chance to start that process […] It starts this week and this time next year we’ll hopefully be waiting to hear our names called on draft day,,” said Halbgewachs, who, like Simba, started every game for the Stingers this past season. It can be a high pressure situation for young players who are hoping to impress scouts to earn the a chance at their dream. Halbgewachs and Simba said they are trying to not let that pressure get to them too much. “The key to these kinds of games or events is to really take it one day at a time. We don’t want to put too much pressure on ourselves,” said Simba, a Réseau du sport étudiant du Québec all-star. He and his teammate said they’re looking to go into the experience without letting themselves succumb to stress. With that in mind, both players have the competition on their mind. Not surprising, seeing as they’ll be playing and practicing against the country’s best. Playing on the Eastern team, Halbgewachs is particularly looking forward to going up against players from back home. “One of the reasons you come [to Concordia] from Saskatchewan is the level of competition, but I’m just excited to play against guys from where I’m from,” said Halbgewachs. Simba has a more specific target for the competition in mind. “I’m really excited to [practice] against one of the best defensive linemen in the country, Mathieu Betts [from Université Laval]. I won’t play against him cause he’s from the East but going against those guys in practice gives you confidence. If you can block that kind of guy, it gives us confidence,” explained the six foot, eight inches tackle. Simba isn’t worried about fitting in with that talent. “The last two years, statistically speaking, [our offensive line] was dominant in the conference,” said Simba. Strong blocking from Simba and Halbgewachs led to Concordia leading the RSEQ in sacks allowed with just 12 over 7 games. Concordia’s offensive line was one of only two to allow less than 100 total yards lost to quarterback sacks. 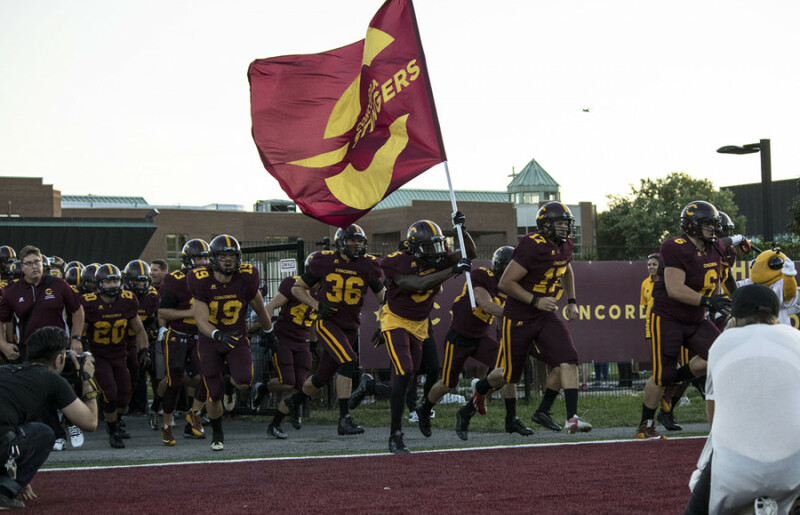 That blocking also gave Concordia’s run game a major boost. Stingers running back Jean-Guy Rimpel lead the RSEQ with 708 rush yards, while the second highest total was only 348 yards. As excited as the two players are, both are heading into the week focused on the task at hand. 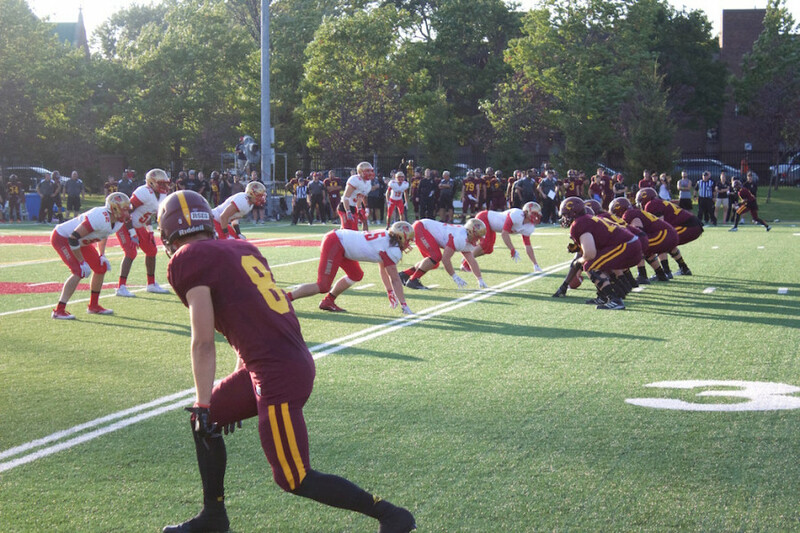 They took the chance to ask fellow Stingers lineman Marc-Antoine Sévigny about his experience at the East-West Bowl to get a better handle on what they’re going into. One thing that Sévigny made sure to let them know was that they may not be sleeping too comfortably. The two players both stand over six foot five and weigh over 300 pounds. According to Sévigny, the dorm beds they’ll be sleeping on aren’t quite made for men that size. Simba isn’t worried about that though.